Is Rangers' Sheppard the Key to Shattering Glass? Is Rangers’ Sheppard the Key to Shattering Glass? When the New York Rangers made their surprise run to the Stanley Cup Finals last season, one of the keys to their success was being able to roll four lines. Their fourth line of Dominic Moore, Brian Boyle, and Derek Dorsett was effective in both shutting down the opposition and chipping in the occasional goal. With Boyle and Dorsett having departed in the off-season via free agency and trade respectively, the Rangers needed to remake their fourth line. Tanner Glass was brought in with the intention of helping solidify that line, but signing him to a three-year contract worth an average of $1.45 million per year was a questionable move to say the least. Unsurprisingly, Glass has not played well whatsoever. However, there is hope for Rangers fans, as newcomer James Sheppard might permanently replace Glass in the team’s regular lineup. Glass, 31, is really nothing more than a middleweight fighter who isn’t even great at that one job, which also happens to be a dying profession in the ever-evolving NHL. Fighting is gradually being phased out, as the game is now more about speed, skill, and puck possession. Speaking of puck possession, Glass is easily the worst player on the Rangers from a statistical standpoint, and one of the worst in the NHL. He is known as a physical player who will take the body, but isn’t an effective hit supposed to move a player off the puck and help one’s own team gain possession? That doesn’t seem to be the case with Glass. His 5-on-5 Corsi-for percentage (the percentage of total shot attempts that belong to the Rangers in 5-on-5 situations while he is on the ice) is a brutal 42.9%. To put this into more context and to illustrate how much Glass drags down his the players around him, his line mates’ Corsi-for percentage throughout the season when NOT playing with him is nearly 10 percentage points higher, at 52.2%. This gap is also the worst of any player on the Rangers with at least 50 minutes played, and the 13th-worst in the ENTIRE NHL. For those who are not as interested in fancy stats, we can look at a traditional metric: plus/minus. I personally tend to take this statistic with a grain of salt, but when you’re a -13 on a team that has scored 44 more goals than its opponents, you must be doing something wrong. The “you” in this theoretical scenario applies exactly in real life to one Tanner Glass. Then there’s the fact that he has a whopping three points (all assists) in 49 games played this season. That includes a recent hot streak of recording one assist in two consecutive games! On 3/24/12, Tanner Glass was on the ice for 0 scoring chances for and 13 scoring chances against in 13.1 minutes of ice time. Then, throwing stats out the window, we can just use the eye test. All anyone can reasonably ask out of a player is to put forth 100% effort all the time. Glass, however, has a nasty tendency to become lazy on back checks, as exemplified on a goal that was scored by Nashville’s Mike Ribeiro last month (watch Glass, #15, as he trails the play). The goal proved to be the game-winner for the Predators over the Rangers. Despite Glass’s obvious shortcomings and ineffectiveness as a player, he seems to be a favorite of otherwise brilliant New York head coach Alain Vigneault, who has chosen to dress Glass fairly regularly this season (Vigneault also knew and coached Glass in Vancouver several years ago), despite almost always having better options like J.T. Miller, Jesper Fast, and the recently-traded Lee Stempniak. Stempniak performed decently well for the Rangers but his style of game was not especially suitable for the fourth line, and Vigneault sometimes healthy scratched him. After pulling off a blockbuster trade to land puck-moving defenseman Keith Yandle from Arizona, New York was still looking for more depth at the forward position prior to the trade deadline — particularly someone with a different style from Stempniak and a little more versatility. Stempniak was dealt to Winnipeg for prospect Carl Klingberg in a move that also gave the Rangers some salary cap wiggle room to bring in another forward who would meet their aforementioned needs. Enter James Sheppard, a versatile bottom-6 player from the San Jose Sharks, who the Rangers acquired for a fourth-round draft pick. Sheppard, 26, can play center — where he is a decent faceoff man — and either wing position, offering the Rangers more flexibility among their depth forwards. With the emergence of J.T. 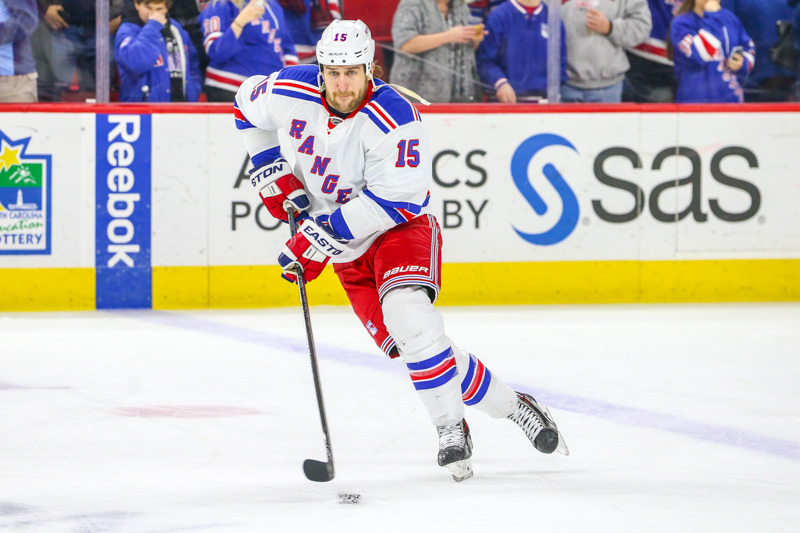 Miller and the chemistry he has shown on the third line with Kevin Hayes and Carl Hagelin, as well as the return of Jesper Fast from a knee injury, Sheppard might be the last piece of the puzzle needed to break Glass and finally convince Vigneault that his optimal lineup would not feature #15. After participating in warm-ups on March 2 but sitting out the game mainly as a result of his hectic travel schedule, Sheppard made his Rangers debut on March 4, replacing Glass in a hard-fought 2-1 overtime loss at Detroit. Despite the outcome, the Rangers played well and probably deserved a better fate. 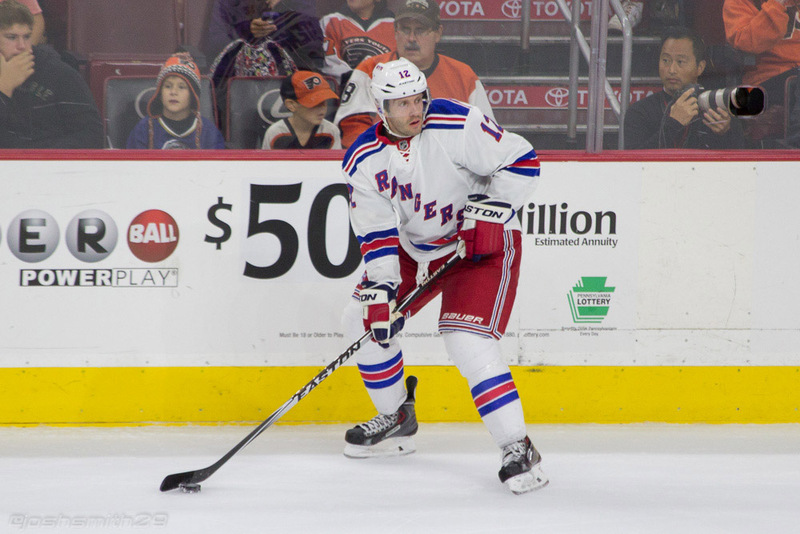 Sheppard contributed by logging about 10 minutes of ice time that Vigneault saw as effective. Sheppard, who had 5 goals and 11 assists this season with San Jose (that’s 13 more points than Glass) will bring more reliability and versatility to the Rangers’ bottom six. He slots in quite nicely as the left wing on Dominic Moore’s line, with Fast completing the line on the right wing. He can also be moved around and help with face-offs when necessary, such as on the penalty kill. His 50% mark on faceoffs is higher than all regular Rangers centers besides Moore. Naturally, another advantage Sheppard has over Glass is with his possession stats (though this is pretty easy for most players to say). His 5-on-5 Corsi-for percentage of 49.7% is ranked right in the middle of Rangers players, so he is not nearly the detriment to puck possession that Glass is. Sheppard’s skill-set and style of play should make him a mainstay in the Rangers’ bottom six group of forwards. His presence in the lineup not only adds value to the Rangers in terms of the benefits he directly provides, but he also adds value by subtracting out the liability that is Tanner Glass (I know I have been harsh on Glass, but he has been completely awful for the Rangers). As the Rangers march towards the playoffs and a potential division title, hopefully Vigneault will stick with the optimal lineup he used in Detroit, where Glass was a healthy scratch.